You can also purchase 1 CEU for this webinar - just follow the instructions below. Get No-Nonsense Tips for Modifier 25. The appropriate use of Modifier 25 can be a little tricky because the requirements are ultra-specific. On the one hand, Modifier 25 is really handy. It creates the opportunity to capture additional physician work done when separate E/M services are provided at the time of another E/M visit or procedural service. And, it’s a more efficient use of both the physician and patient’s time by saving additional trips to the doctor’s office. However, Modifier 25 is famous for invoking frustration for a number of reasons. 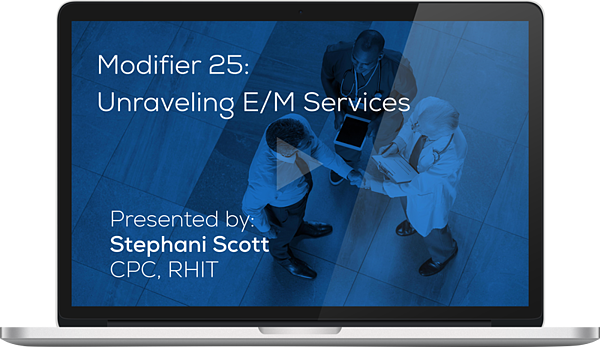 One being that understanding when, specifically, a provider can use Modifier 25 can leave us all scratching our heads. Filling out the form below will allow you to watch the on-demand webinar for free. On the next page you will then have the option to purchase 1.0 CEU for $30. PLEASE NOTE: This program meets AAPC guidelines for 1.0 CEU. Can be split between Core and all specialties with the exception of CPCO, CIRCC and CASCC. You will receive your CEU in a separate email after the presentation. On-Demand viewing requires successful completion of the post-test for continuing education units.